European leaders will gather in Brussels later on Wednesday to decide on the United Kingdom’s immediate future in the European Union. The president of the European Council, representing the member states, is recommending that they accord a much longer delay to Brexit than the British prime minister is officially seeking. Theresa May, with parliamentary backing, has asked for an extension until June 30. Under the revised timetable agreed at a summit last month, the UK is due by law to leave the EU this Friday, April 12. Donald Tusk has written to EU leaders to suggest that the UK’s exit be delayed by up to a year, saying that “one possibility would be a flexible extension” allowing it to be cut short if the negotiated withdrawal deal is ratified. He explained why he thought May’s request for a shorter extension should be rejected. 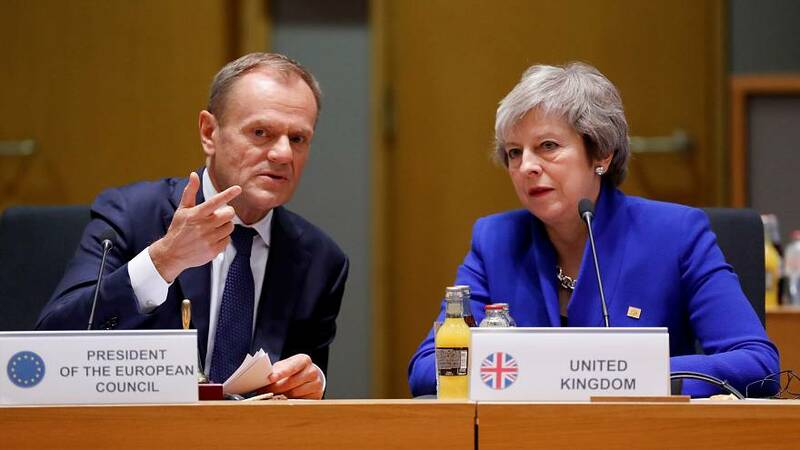 “Our experience so far, as well as the deep divisions within the House of Commons, give us little reason to believe that the ratification process can be completed by the end of June,” Tusk wrote. A draft EU document circulated ahead of the summit also proposes a flexible extension, but leaves the exit date blank. Ahead of the summit, Belgian Prime Minister Charles Michel will host a meeting of Britain’s closest neighbours who would be hit hardest by the disruption of a no-deal Brexit. Theresa May, whose successive attempts to ram the Brexit deal through parliament have failed, spent Tuesday on a shuttle mission to Berlin and Paris to seek support from Angela Merkel and Emmanuel Macron. The German chancellor said after her meeting with May that a delay until the end of 2019 or early 2020 was possible. France has spoken out against a long extension but has been softening its position. Read more: What do EU leaders say about another Brexit extension? Some EU countries are concerned that a badly-behaved Britain still inside the bloc, but with its future unresolved, may disrupt EU business. "The United Kingdom shall facilitate the achievement of the Union's tasks and refrain from any measure which could jeopardise the attainment of the Union's objectives," read the EU draft seen by Reuters. Earlier on Tuesday, the EU’s chief Brexit negotiator Michel Barnier said the bloc was ready to grant a delay, but that there had to be a good reason. "Any extension should serve a purpose. The length should be proportional to the objective. Our objective is an orderly withdrawal," he told a news conference in Luxembourg. EU ministers have said the UK prime minister has failed to meet their conditions for a further extension, set at the March summit when Brexit was first delayed from March 29 to April 12. London was instructed to come up with an alternative plan to crashing out. The outcome of Wednesday’s summit is uncertain. However, there is no appetite – yet – among EU leaders to cast Britain adrift in a chaotic, economically and politically disruptive no-deal Brexit. On Tuesday British MPs endorsed the prime minister’s request to delay Brexit until June 30. It followed moves by opposition Labour MP Yvette Cooper to block a no-deal Brexit. Talks between May’s Conservative government and Labour aimed at finding a compromise deal that can secure a majority in parliament are due to continue on Thursday. Labour's demands include keeping Britain in a customs union with the EU, something that is hard to reconcile with May's desire for Britain to have an independent trade policy, and a second referendum on any deal. The prime minister’s sudden shift in strategy in seeking a deal with the opposition has sparked a backlash in her own party. Many Brexit supporters are furious at the prospect of a long delay and the UK having to take part in European Parliament elections in May – nearly three years after the country voted to leave the EU in the June 2016 referendum.